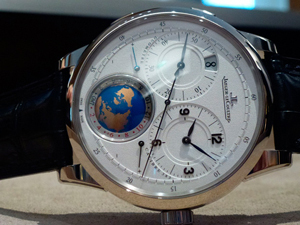 Popular watchmaker Jaeger-LeCoultre, known worldwide for ITS exclusive watches models, represents a novelty Duometre unique travel time. Gorgeous model is equipped with a new 383 with manual winding caliber, which was created by the master brand Jaeger-LeCoultre. Mechanism, with a diameter of 34.3 mm and thickness – 7.25 mm, manufactured, assembled and decorated by hand. Caliber consists of 498 components, assembled by 54 stones, has a frequency of 28,800 vibrations per hour, and two wind-up reel, providing 80-hour power reserve. Dual system of the plant caliber separates into two parts, the first of which provides an indication of the local time, and the second is responsible for the second time zone. Each mechanism ITS has own power source, which eliminates the possibility of errors in the because the display of interaction. Caliber PERFORMS the work of two power-reserve indicator, and a world time function, which is represented by a spinning globe on record 6:00. Duometre model unique travel time has a round body with a diameter of 42 mm and a thickness of 13.65 mm in white gold. Water resistant – 5 ATM. Silver dial with new items grainy pattern features a large central arrow and two symmetrically arranged counters have labels “2:00” and “10 hours“. The first of these is provided to indicate the hours and minutes, and the second – for the time display in the second time zone. Meter the mark at “10 O’Clock” posted date aperture. Sleek new comes on the alligator strap in black leather with buckle-pin in white gold. Duometre model unique travel time limited edition – 100 copies, which will be on sale from November 20. Unlimited series will be Jaeger-LeCoultre brand in 2013 at the exhibition SIHH in geneva.